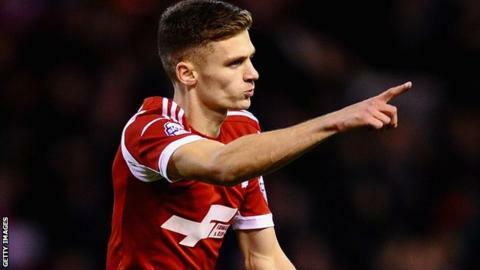 Jamie Paterson earned 10-man Nottingham Forest a point as they fought back from two down to draw with Sheffield Wednesday. Chris Maguire scored from the penalty spot to put Wednesday ahead, but Forest equalised when Jamie Mackie headed in. Lewis Buxton nodded in and then Joe Mattock gave Wednesday a two-goal advantage with a long-range finish. Marcus Tudgay headed home and, though Forest had Danny Collins sent off, Paterson equalised late on. Though it earned Forest a point it continues a poor run of form for the Reds, who have not won any of their previous 11 games in all competitions. That has seen them drop away from the Championship play-off places to sit 10th, four points off the top six. Sheffield Wednesday, meanwhile, are 15th with 49 points. "I think we were worthy of the three points. We scored three good goals and I think we could have done something about all three of their goals. "It is frustrating how many goals we are giving away and how many goals we have to score to win a game." "There were tired minds and legs. We had far too many players running with the ball instead of just passing and picking the 10 men off, but we went chasing another rather than just letting it happen. "We probably needed just a little bit more experience on the pitch. After our third goal, we should have just managed the game and seen it out. In the end, though, we possibly could have lost the game." Match ends, Nottingham Forest 3, Sheffield Wednesday 3. Second Half ends, Nottingham Forest 3, Sheffield Wednesday 3. Corner, Nottingham Forest. Conceded by Lewis Buxton. Attempt blocked. Jamie Paterson (Nottingham Forest) right footed shot from outside the box is blocked. Assisted by Daniel Harding. Attempt missed. Giles Coke (Sheffield Wednesday) left footed shot from outside the box misses to the left. Assisted by Chris Maguire. Goal! Nottingham Forest 3, Sheffield Wednesday 3. Jamie Paterson (Nottingham Forest) from a free kick with a right footed shot to the top left corner. Marcus Tudgay (Nottingham Forest) wins a free kick in the attacking half. Attempt missed. Lee Peltier (Nottingham Forest) left footed shot from outside the box is high and wide to the left. Substitution, Sheffield Wednesday. Atdhe Nuhiu replaces Jeremy Helan. Attempt saved. Caolan Lavery (Sheffield Wednesday) right footed shot from a difficult angle on the right is saved in the bottom right corner. Assisted by Giles Coke. Attempt saved. Henri Lansbury (Nottingham Forest) right footed shot from outside the box is saved in the centre of the goal. Assisted by Matt Derbyshire. Offside, Sheffield Wednesday. Miguel Ángel Llera tries a through ball, but Leon Best is caught offside. Second yellow card to Danny Collins (Nottingham Forest) for a bad foul. Greg Halford (Nottingham Forest) wins a free kick on the right wing. Goal! Nottingham Forest 2, Sheffield Wednesday 3. Marcus Tudgay (Nottingham Forest) header from the left side of the six yard box to the high centre of the goal. Assisted by Jamie Mackie with a cross. Substitution, Nottingham Forest. Greg Halford replaces Gonzalo Jara. Jamaal Lascelles (Nottingham Forest) wins a free kick in the attacking half. Attempt missed. Jeremy Helan (Sheffield Wednesday) left footed shot from the left side of the box is too high. Substitution, Sheffield Wednesday. Caolan Lavery replaces Michail Antonio. Lee Peltier (Nottingham Forest) wins a free kick in the attacking half. Attempt missed. Leon Best (Sheffield Wednesday) header from the centre of the box is too high. Assisted by Joe Mattock with a cross following a corner. Corner, Sheffield Wednesday. Conceded by Danny Collins. Attempt missed. Leon Best (Sheffield Wednesday) header from the centre of the box is too high. Assisted by Chris Maguire with a cross following a set piece situation. Foul by Daniel Harding (Nottingham Forest). Leon Best (Sheffield Wednesday) wins a free kick on the right wing. Lee Peltier (Nottingham Forest) has gone down, but that's a dive. Attempt missed. Danny Collins (Nottingham Forest) header from the centre of the box is high and wide to the left. Assisted by Jamie Paterson with a cross following a corner. Substitution, Nottingham Forest. Marcus Tudgay replaces Darius Henderson. Corner, Nottingham Forest. Conceded by Joe Mattock.